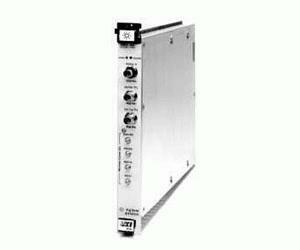 The Agilent E1437A analog-to-digital converter (ADC) is a single-slot, C-size, VXI module providing 23-bits of raw resolution at 20 MSamples/second sample rate -- twice as fast as the previous generation ADC -- to uncover signal details users could never see before. This module is especially effective in systems using digital signal processing (DSP) to analyze signals. Such processing ranges from simple averaging to filtering, Fourier transforming, curve fitting, demodulating and more. The module includes input signal conditioning and an 8 MHz anti-alias filter that guarantees signals outside the analysis bandwidth do not corrupt data samples. Twenty-four decimation type filters and a digital LO are included to help users reduce noise and reject extraneous signals. A large FIFO memory assists signal capture and downstream signal processing. VXI plug&play compatibility makes the Agilent E1437A easy to program with popular graphical programming tools like Visual Basic and Agilent VEE.